It no longer comes as a surprise when we hear that Google keeps a track of what we search on the web. Google records all our online activity, knows the places we visit, and that’s how the tracking has been done to show directions when using Maps. But with the latest update Google is behaving like the next door sneaky neighbor! It will now keep a snapshot history of what you search for in Google search. To see it on your device open the app. Under the ‘Recent’ option, you can see the searches that you’ve made in the past in the form of a screenshot. Google carefully describes this as an easy way to look for what you have searched in the past using Google search. With this new feature in the app the users can easily look for their search history. In addition, pages from the same search will be grouped and you can see the newest one first. Just swipe up on any page that you see and you can remove it. This doesn’t mean your search is removed from the search history. If you are worried about the space on your device, then don’t! All this data is stored on Google servers. But it is weird to see screenshots of what you looked at, each time you open the app. But there is a brighter side to it, it is a convenient way to visually look through previous searches. Who wants to see snapshots of the search history each time you open the app? Not everyone would like this idea and would like to get rid of them. So is there a way out to delete these screenshots? Well, there is. If you don’t want to be tracked this way by Google, you can delete the screenshots and disable the feature too. To delete individual screenshots, open the Google app and tap on the History icon. By default you can see a horizontal list of searches from the past seven days. Swipe up on any stack of screenshots to get rid of them. Alternatively, you can tap the blue button (with a number in it) to view individual screenshots related to a search. Swipe up on any respective card to delete it. Deleting the screenshots individually seems a tedious job is there no easy way to do this work? It is not possible to remember and delete the screenshots each time after searching. So how can you disable this feature? Open the Google app, slide out the menu and tap Settings > Accounts & Privacy. Slide the switch next to Enable Recent to the disable it. 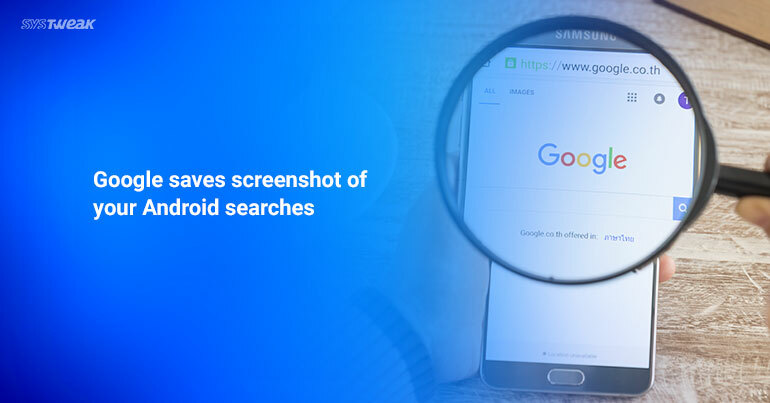 Once you disable it, you will no longer see screenshots of your search history when you open the app. This new feature is an extension of Google’s My Activity dashboard. But you can definitely control what kind of your history you want to see. To do so you need to go to Google Activity Controls and/or My Activity from your Google menu screen. Apart from that you can open the app and simply follow the steps discussed to either delete the screenshots or disable the feature. But this definitely rings a bell that apart from history and location tracking features what else is Google tracking that we are not even aware off? We will be updating you time to time when we have more information to share. So stay tuned. Snapchat Draining Your iPhone’s Battery Life? Here’s How to STOP!